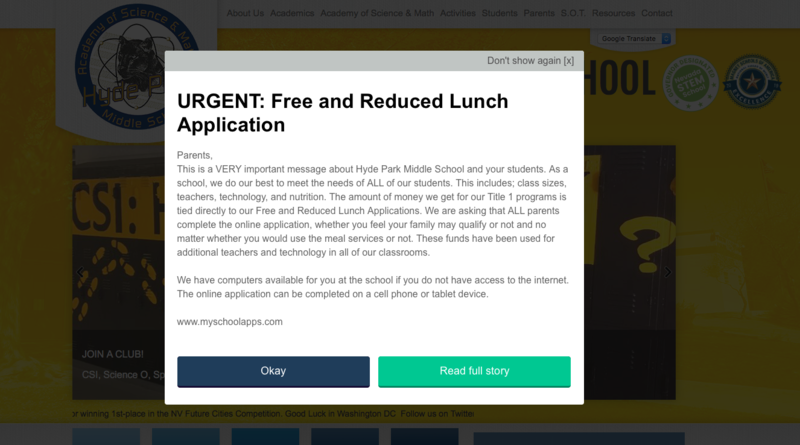 A pop-up message on Hyde Park Middle School’s website is a sign of the times in the Clark County School District, which recently changed how federal money for low-income students is distributed. Labeled “URGENT,” it asks all parents — for the sake of the school and its students — to complete an online application for free and reduced-price lunch. “The amount of money we get for our Title 1 programs is tied directly to our Free and Reduced Lunch Applications,” the bulletin states. Hyde Park Middle School is one of 55 schools that could lose Title I funding in the upcoming academic year. District officials last month announced a new allocation method that directs more Title I money to the neediest schools by increasing the threshold to receive that funding. Previously, any schools with 40 percent or more students eligible for free or reduced-price lunch (FRL) qualified for Title I funding, but going forward, only schools with FRL rates of 60 percent or greater will receive the extra money. This screen shot of a pop-up message on Hyde Park Middle School’s website was taken Wednesday, Feb. 6, 2019. In general, students from a four-person household with an annual income of $46,435 are eligible to receive a reduced-price lunch, while families of the same size making $32,360 annually qualify for free lunches, according to guidelines from the Department of Agriculture. The shift has ruffled feathers across a district that has weathered several budget crises in recent years. About 10 schools, including Hyde Park, with FRL rates between 57 percent and 59.99 percent have appealed the decision, said Mike Barton, the district’s chief college, career and equity officer. The district has not determined which appeals, if any, it will approve. “Even the haves don’t have that much when you’re talking 59 percent of the school qualifies (for FRL),” said Meredith Freeman, whose sixth-grade twin daughters attend Hyde Park. The situation has intensified calls for education funding fixes at the state level. Lawmakers convened this week in Carson City for the 80th legislative session, where they will be mulling changes to the funding formula as well as other education money requests. Chet Miller, president of the Nevada Education Association of Southern Nevada, works as a physical-education teacher at Hollingsworth STEAM Academy. The downtown Las Vegas elementary school stands to benefit from the policy change because all of its students receive free or reduced-price lunch. But he’s still not keen on it. He invoked the “robbing Peter to pay Paul” idiom to describe the predicament. The policy change means some schools will lose out on as much as several hundred thousand dollars, while the needier schools see their Title I budgets blossom. Desert Pines High School, for instance, receives roughly $865,000 worth of Title I funds this year, but that amount will grow to $1.19 million next year, Barton said. Elementary schools, which generally serve fewer students, will see smaller bumps. Myrtle Tate Elementary School is among the campuses that will benefit. The northeast valley school has a 100 percent FRL rate, and 44 percent of its students are learning English as a second language. 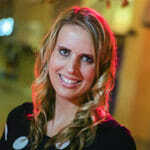 It also deals with a transient student population. Principal Sarah Popek said the school has welcomed 58 new students and said goodbye to 23 others who moved in just the last month. That’s a net gain of 35 students, some of whom have missed months of school and are behind academically as a result. The school received about $339,000 worth of Title I funds this academic year, Popek said. Next year, that amount will increase by roughly $37,000. Popek considered the news bittersweet. She knows it’s causing hardships at other schools. “The problem with Clark is that we have so many needy schools,” she said. Plus, the extra Title I funding won’t be a panacea for the school. Myrtle Tate moved up to a three-star ranking under the state’s performance framework this year, which led to a loss of class-size reduction funds, she said. The school’s strategic budget for the 2019-2020 academic year includes three fewer teacher positions as a result. The additional $37,000 doesn’t even cover one teacher’s salary and benefits. The school’s winding hallways, however, reveal some ways Title I funds are helping the at-risk school. Instructional assistants for three classrooms — one first-grade and two fourth-grade — support high-achieving educators who have agreed to teach larger class sizes. Fifth-graders, meanwhile, are divided among five male teachers to curb discipline problems. And teachers attend professional development every week during one of their planning periods. If the school received adequate base funding, she said, the Title I funds could be more supplemental as intended rather than filling staffing holes. Popek said educating the school’s 875 students — some of whom lack shoes, let alone paper and pencils — simply costs more than what’s allotted. Gov. Steve Sisolak’s $8.8 billion budget for the next biennium includes more money for educator salaries, the proposed weighted funding formula and teacher reimbursements for classroom supplies, among other things. But whether those priorities remain intact as the legislative session unfolds and education policy fights ensue remains to be seen. Sisolak didn’t directly respond to a request for comment about the Clark County School District’s decision to change its Title I funding policy. Instead, his spokeswoman, Helen Kalla, emailed a statement reiterating his commitment to updating the state’s funding formula. School district officials have maintained that it’s move designed to promote equity by boosting the neediest schools, which tend to have higher turnover and less-experienced teachers. 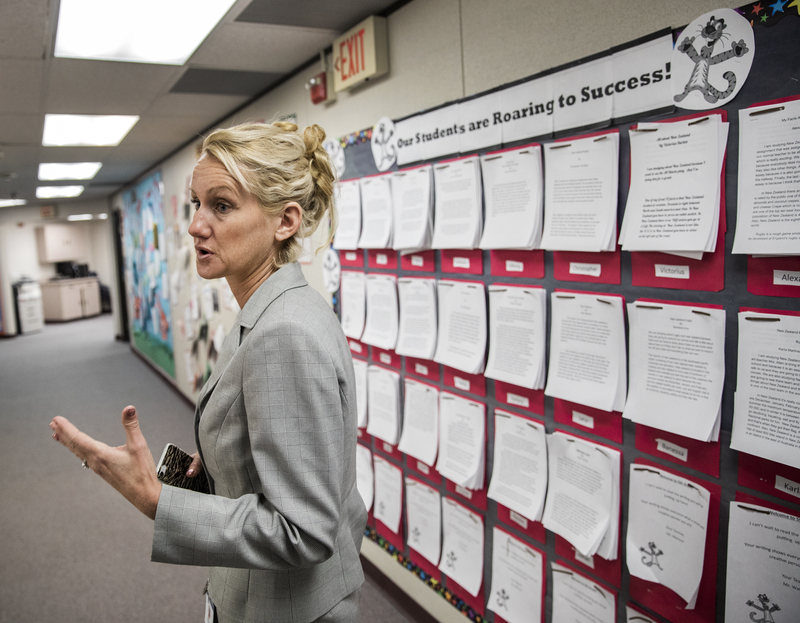 Lola Brooks, president of the Clark County School Board of Trustees, said the district should have done a better job communicating the underlying reason behind the change. The school district released a fact sheet about the change after the decision became public and irked some parents, educators and community members.